Unique and beautiful, the Official NASA Moon Desk Globe will instantly intrigue students and visitors. It includes amazing geographical details about our moon that very few people know of. 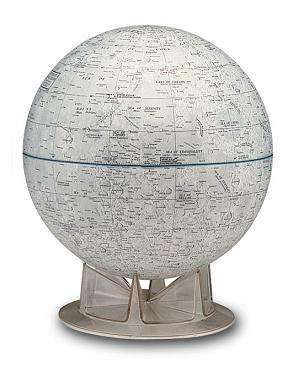 The high-quality paper fiber globe ball accurately depicts the craters, mountains and seas of the lunar surface. Comes with a detachable plastic base. The NASA Moon Globe is backed by a one year warranty.